Elevate Festival 2012 - Elevate the Apocalypse? 2012 - The Apocalypse was placed as the central theme of the Elevate Festival in the form of a question: Are we going to achieve the much-needed shift towards solidarity-based economies and lifestyles that respect inherent ecological limits? Or will major disasters be necessary to bring about fundamental changes? "Doomsday 2012" has been a reoccurring theme in the media for several years now - not least due to various predictions allegedly derived from Mayan traditions. The Winter Solstice on 21 December 2012 is incorrectly referred to as the end of the Mayan calendar, and used as an opportunity to spread dubious disaster scenarios - triggered by an abrupt geomagnetic reversal or by the sudden appearance of a "Planet X". Beyond this, however, lie a whole lot of actual threats: unless a fundamentally different course is struck, the current economic crisis will continue to worsen, and the apparent de-democratization in the Western world will proceed. If we fail to keep climate change in check to a certain extent, significant parts of this planet may become uninhabitable for humans even within this century. And not to forget: the nuclear threat still persists even within Austria, especially by outdated nuclear reactors near the border, although it hardly crosses our mind these days. For an increasing number of people, however, especially in the global south, the major catastrophe has already ceased to be a future threat, and become everyday life: The rise of hunger, poverty and misery is the result of a global economic system that demands continual economic growth and therefore drives an ever-increasing resource consumption which leads to the destruction of vital ecosystems and arable soils. As part of the three theme days "Understand! ", "Act!" and "Develop! ", the discourse program offers analyses of the latest developments by renowned experts (Understand! ), presents forward-thinking alternatives that invite to become active (Act! ), and tries, in cooperation with the audience, to further develop important pillars of our society (Develop!). Concrete examples of alternative practices in the areas of food, energy and construction / housing will be presented, as well as strategies and concepts for a comprehensive democratization of societies, new forms of communication and solidarity-based models of economic activity - beyond exploitation, competition and profit. A dialogue forum, organized in cooperation with the Austrian Broadcasting Association (ORF), deals with various approaches to the theme of the festival and examines psychological aspects and the role of the media. At the concluding Elevate Awards Show, awards are given out for the first time, to individuals and initiatives that are helping to make this world a better place. The winner of the International Elevate Award was the woman-grassroots initiative REFDAF from Senegal. 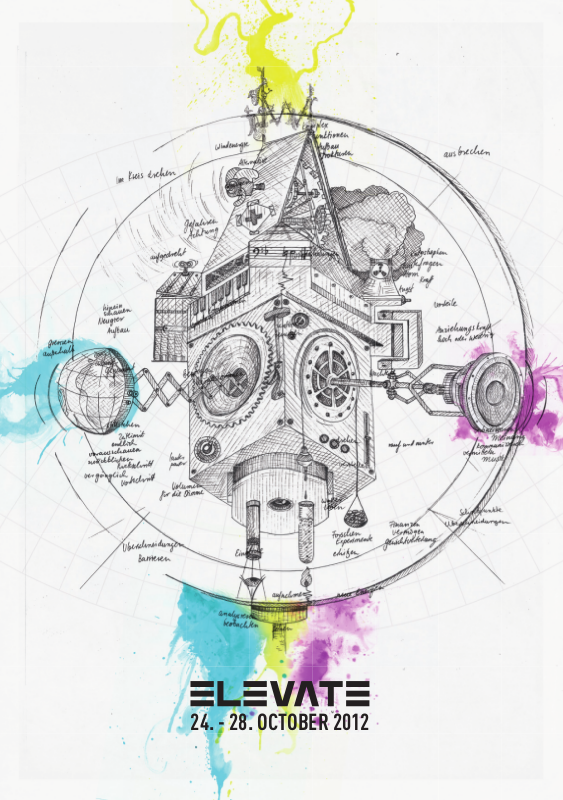 Susanne Posegga won the Elevate Artivism Award and the Hofkollektiv Wieserhoisl won the Elevate Award Steiermark. Under the motto „Elevate the 21st Century“, the development of past years and perspectives for the future were discussed. Although there was a huge progress in technical issues, a positive change of society has to come from human beings. In addition to the Festival Opening, Sunday was certainly one of the festival’s highlights. The documentary film “The Crisis of Civilization” and the main discussion in the evening brought different perspectives of experts together. National and international guests like Mark Stevenson, Corinna Milborn and James Vasile shared their ideas and seeded a lot of motivation with the audience. This year, the music-program again presented a mixture of electronic music, far away of mainstream. In discussions on Saturday and Sunday, artists took a look at the future of bass- and electronic-music. Workshops also offered the opportunity to improve the personal knowledge about music practically. The literature-program was held in cooperation with the Kulturzentrum bei den Minoriten again as hörgeREDE – the festival inside the festival. 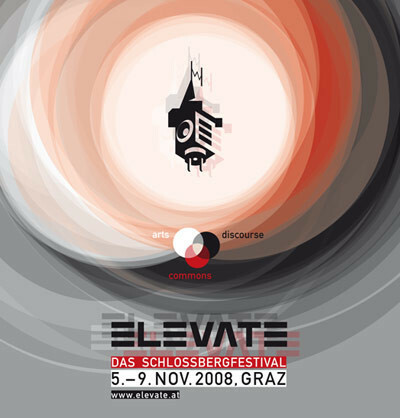 The Elevate Festival has been known internationally for many years. This time a Bavarian Broadcast–team came to the Styrian capital to report live on the festival and the city. In addition, cooperation with national Media was supported – Radio Helsinki and okto.tv put some of the discourse events live on air. 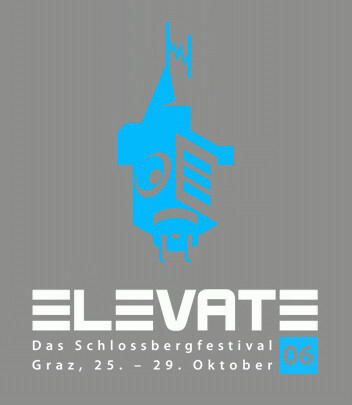 FM4 and the Kleine Zeitung reported on the festival constantly. By using the technology of the 21st century, it was also possible to see the discourse program online. Some hundred viewers were counted on the Live-Stream of the Festival’s mediachannel. Data transmission was supported by the new cooperation partner Citycom, which also enabled free WLAN-access at the Forum Stadtpark and the Dom im Berg. The Elevate Festival 2010 - "Elevate Civil Society" - presented internationally acclaimed guests like Iara Lee, Béatrice Achaleke and Mike Bonanno of The Yes Men and featured discussions on some of the most important issues of our time and tried to find ways for everyone to work against the climate and economic crisis. At the same time Elevate offered a wide range of electronic music, which inspired conscious listening. 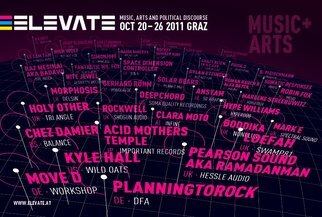 Big names like Robert Hood, Joy Orbison and Merzbow made music aside the mainstream and showed their desire for experiments.A newly created literature program was featured, as well as workshops in the Elevate Lab and a new discourse part in tthe music secion called "Elevate Music Talks". Elevate Festival 2009 - Elevate The Crises! 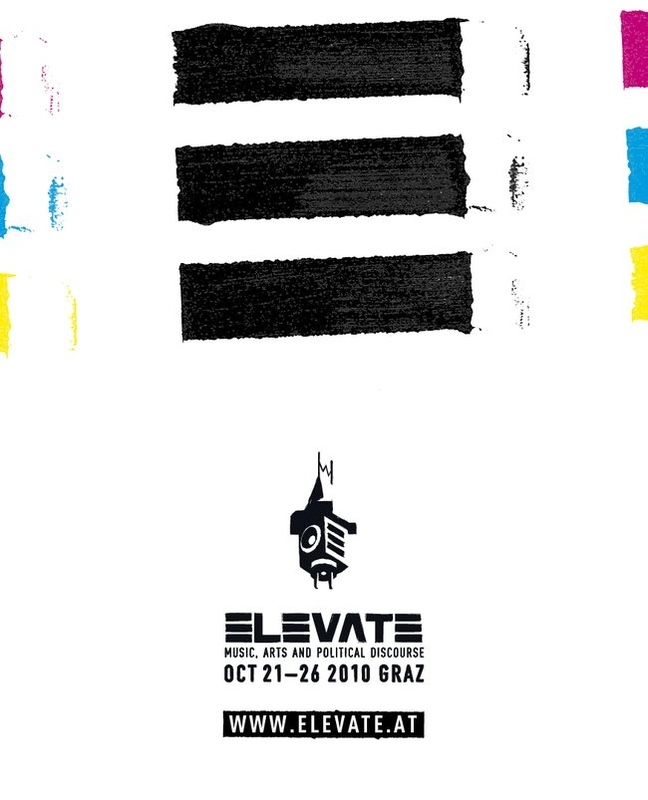 With an extensive program of discussions, workshops, lectures, and film presentations, Elevate Festival 2009 fostered a better understanding of serious world crises (in the areas of climate and energy, natural resources, nutrition, economy, politics and media) that are currently posing significant challenges to humanity. At this juncture, the focus was on examinations of alternative perspectives and analyses diverging from inadequate explanatory models, which are frequently distorted by political interests and dominated by mainstream media and public discourse. Leading expert on the ecological crisis, geoengineering and nanotechnology, and laureate of the Right Livelihood Award, Pat Mooney (CA); NY Times journalist and winner of the 2009 Pulitzer Price for investigative reporting, David Barstow (US); co-founder of the daily news program Democracy Now! and laureate of the 2008 Right Livelihood Award, Amy Goodman (US); historian and long-standing reporter for Austrian public TV ORF, Raimund Löw (AT); leading expert on agricultural policy and sustainable food systems, and winner of the 2008 and 2009 Derek Cooper Award at the BBC's Food and Farming Awards, Geoff Tansey (UK); bestselling author and Attac Austria co-founder Christian Felber (AT); renowned journalist and lecturer at the University for Journalism FH Vienna, Anneliese Rohrer (AT); professor of geophysics and director of the Wegener Center for Climate and Global Change, Gottfried Kirchengast (AT); outstanding economist and political scientist, Gabriele Michalitsch (AT); organic farmer and ÖBV Via Campesina Austria speaker, Irmi Salzer (AT); journalist and author of the Austrian media encyclopedia, Harald Fidler (AT); distinguished political scientist and professor emeritus of Johann Wolfgang Goethe-University Frankfurt am Main, Joachim Hirsch (DE), and many more..
Elevate Festival 2008 - Elevate The Commons! 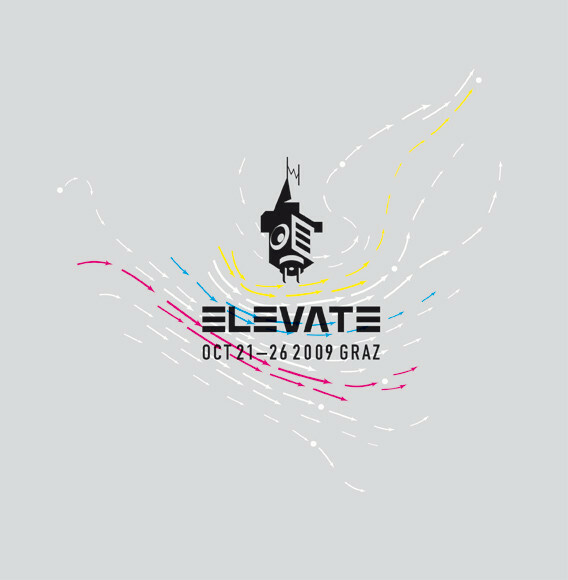 The aim of Elevate 2008 was, together with scientists and activists, to raise awareness of the importance of Commons and to shed light on the social and cultural conflicts in the usage of these goods. This was the framework for discussions, workshops, films and lectures as well as for the presentation of innovative projects. The Elevate festival 2007 adressed different critical views on the topic of democracy through a dense schedule of lectures, discussions, workshops and film screenings. It was a gathering of forward thinking activists, authors and scientists as well as a playground for new ideas and projects. The stage was set for an open minded discourse and intellectual ex-change through talks from a combination of internationally acclaimed guests and local activists, as well as through public interaction in panels and discussions. Three topics over three days - "technology", "media and journalism" and "critique, theory and perspective" offered abundant opportunity for wide participation. Guests included: the long term U.S. member of congress, Cynthia McKinney; Nieman Fellow in Journalism at Harvard University, and radio news Director turned CNN and Emmy Award winning ABC News Producer, Danny Schechter; filmmaker, Eminem video director, guerrillanews.com founder and activist Ian Inaba from New York; U.S. community Internet pioneer and wireless communication expert Sascha Meinrath; british author Dr. Richard Barbrook; net-activist and co-founder of "telepolis" online magazine, Armin Medosch; the software developer and author Corinna "Elektra" Aichele from Berlin; the author and publisher Christian Felber as well as the political scientist Univ. Prof. Dr. Ulrich Brand; the president of Reporters without Border Austria and long term ORF editor Dr. Rubina Möhring, the danish documentary film maker Karsten Kjaer and many other people who are concerned with and engaged in the topic of democracy. Elevate Festival 2006 - Elevate The Debate! 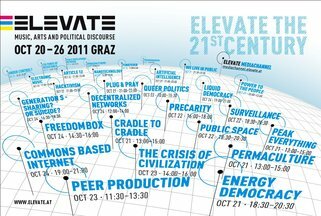 Also in 2006 elevate was not just about music, but also about political discourse and knowledge. It was a gathering of forward thinking activists and initiatives as well as a playground for new ideas and projects. Topics such as "guaranteed basic income", "free media / public television and radio / perspectives of digital technology" and "digital video streaming and distribution", were presented and discussed in a relaxed atmosphere. Independent organisations and all kinds of activists were featured and were also incorporated into the planning process of the content of the festival. The festival was and is about encouraging people to think and act politically as well as empowering critical positions. Furthermore a lot of workshops are hosted by the elevate festival: Tim Exile's Clevaclox, as well as workshops on Streetart and VJing.